Book 5, "Harry Potter and the Order of the Phoenix." Read thousands of book reviews and/or order book 5 from Amazon.com Readers give the book a rating of 4.5 out of 5. The movie version was released in 2007. 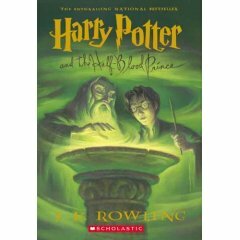 Book 6, "Harry Potter and the Half-Blood Prince " went on sale on 2005-JUL-16. The retail price is $29.99 in U.S. dollars. Readers also gave this book a rating of 4.5 out of 5. However, you can safely order the book from the Amazon.com online book store for $17.99 -- a 40% discount. The movie was released on 2009-JUL-15. "We are delighted to announce the publication date. J.K. Rowling has written a brilliant story that will dazzle her fans in a marvelous book that takes the series to yet greater heights. 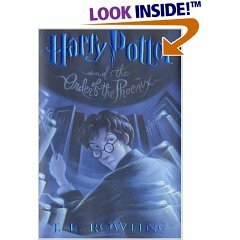 Harry Potter and the Half-Blood Prince delivers all the excitement and wonder of her best selling previous Harry Potter novels." Amazon.com recommends an age range of 9 to 12 years. Book 7, "Harry Potter and the Deathly Hallows." On 2006-DEC-20, J.K. Rowling announced the title of the final book in the series. The book was released on 2007-AUG-21 (not 2007-JUL-07 -- 07.7.7 -- as originally speculated). The movie will be released in two parts. Filming of the the first part of the movie has begun. You can safely order the book at Amazon.com They offer the book for $18.89 -- a 46% reduction plus shipping.